Students have seven lessons per fortnight of English in Key Stages 3 and 4. They will be studying two separate GCSEs in English Language and English Literature and we use the AQA exams. Throughout their time at school and in English we aim to encourage a love of reading across a wide range of texts from plays, prose and poetry. We aim to develop high levels of literacy in reading, writing and speaking and listening. Teacher chosen choice of text. Writing skills that develop pupil’s ability to present an argument. Fiction and non-fiction extracts alongside poetry that share the theme of ‘Mystery’. Teacher chosen choice of text and scenes. A selection of Victorian literature extracts including study of the era and culture. Variety of texts – possibly ‘Ruby in the Smoke’, ‘Street Child’ or ‘Paupers’. Use of visual stimulus to promote descriptive writing. Narrative writing skills and structuring covered. A range of fiction and non-fiction texts and extracts including poetry that explore the same theme. Whole class presentations and individual presentations on set themes. UWS produced anthology of extracts from major 19th century gothic works, including ‘Frankenstein’ and ‘Dracula’. A variety of non-fiction extracts to be studied and GCSE style skills addressed. Pre-read of the GCSE 19th century text. Skills taught and practiced across a range of descriptive and narrative tasks. Poetry terminology, approaches to unseen texts and poetry structure is taught. Pre-read of the GCSE Modern Novel. Reading – Unseen literature extract from 19th, 20th or 21st Century. An extract from a piece of fiction chosen by the exam board and previously unseen. Comprehension, Language, Structure and Evaluation. Choice of task – Visual stimulus for a descriptive task – unseen OR unseen narrative writing task. Reading – Unseen non-fiction extract from 19th, 20th or 21st Century. Two extracts from pieces of non-fiction chosen by the exam board and previously unseen. True and False, Summary, Language & Attitudes/ Values. Writing your own opinion/ views on a subject given in the exam paper. 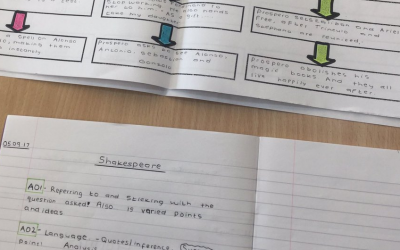 Paper 1 – Shakespeare & 19th Century Novel. Extract based question on ‘A Christmas Carol’ by Charles Dickens. Extract based question on either – ‘Macbeth’ or ‘The Tempest’ by William Shakespeare. Paper 2 – Modern Novel, AQA Poetry Anthology, Unseen Poetry and Unseen Poetry Comparison. Choice of two questions based on ‘Animal Farm’ by George Orwell. Comparison essay question based on the ‘Power and Conflict’ section of the AQA Poetry Anthology – 15 poems. Exam board chosen poem for the exam. Exam board chosen poem for the exam – to be compared with the above. KS3: Summary how units/work is marked. At the end of each half term in Yr. 7, 8 & 9 there is an assessment, this alternates between language and literature. This is assessed against the 1-9 national scale. Pupils progress, attitude to learning is also assessed. KS4: Summary how units/work is marked. At the end of each half term, or more often, there is an assessment, this alternates between language and literature. A formal set of Yr 10 exams will be sat in the Hall at the end of Yr. 10. Formal Yr 11 Mocks occur in English from October – December of the Yr. 11 year. All assessment is 100% exam based. Two English Language Exams at the end of Yr 11 & Two English Literature Exams at the end of Yr. 11. KS3: Summary of work set during KS3. Variety of home work tasks set and assessed across KS3. These include: Research projects, learning of spellings, reading, AR reading, essays, practice P/Q/A writing, re-writing of key paragraphs, descriptive writing, narrative writing and opinion writing. KS4: Summary of work set during KS4. External run competitions including the 500 Word Radio 2 Competition and National Handwriting Competition. Pupils last year took part in writing short stories for a number of nationally produced anthologies. We had the Royal Shakespeare Company screening of ‘Macbeth’ shown at UWS for our Yr 10’s and 11’s.